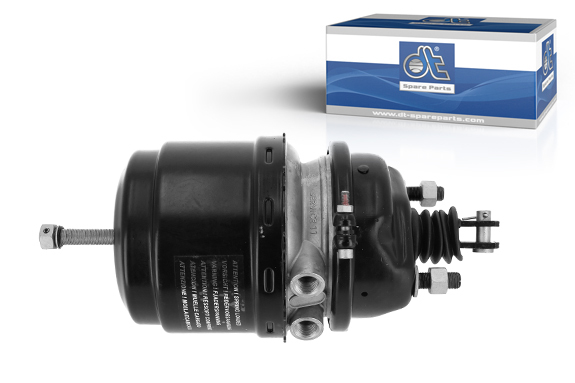 The combined spring brake cylinder 3.74016 is characterised by high performance and a long service life. It is subject to a total of 12 different quality controls. One special feature is the internal venting, which prevents moisture and dirt from entering the spring chamber. The special aluminium housing and zinc-nickel coating provide optimal corrosion protection, while the hardened fork head ensures a long life and safe use. DT Spare Parts‘ spring brake cylinders feature type and connection markings as well as other information, such as the tightening torque for the emergency release screw. The item is under pressure due to a pre-tensioned spring. Before removal/installation, the cylinder‘s inner spring must be secured by unscrewing the spindle. The item can be removed/installed when in the released state and not under pressure. After installation, screw the spindle back in. During installation, pay attention to the mounting position of the item. The vent hole on the front diaphragm brake cylinder must point downwards so that the condensation water can drain out. Remove any plastic plugs from the lower vent hole. Replace brake cylinders in axle pairs to achieve optimum braking performance. Perform a visual inspection and functional test under all operating conditions after each replacement.